A rectangular box made of huanghuali, the straight sides with gently rounded corners and the cover with a slightly domed top. The horizontal edges of both box and cover are carved with a beaded lip. The well-polished exterior has acquired a beautiful patina. Small, undecorated lidded boxes made from precious hardwoods were widely appreciated for their simplicity during the Ming and Qing dynasties. They served well on the scholar’s desk or any part of the household, where small items were stored. 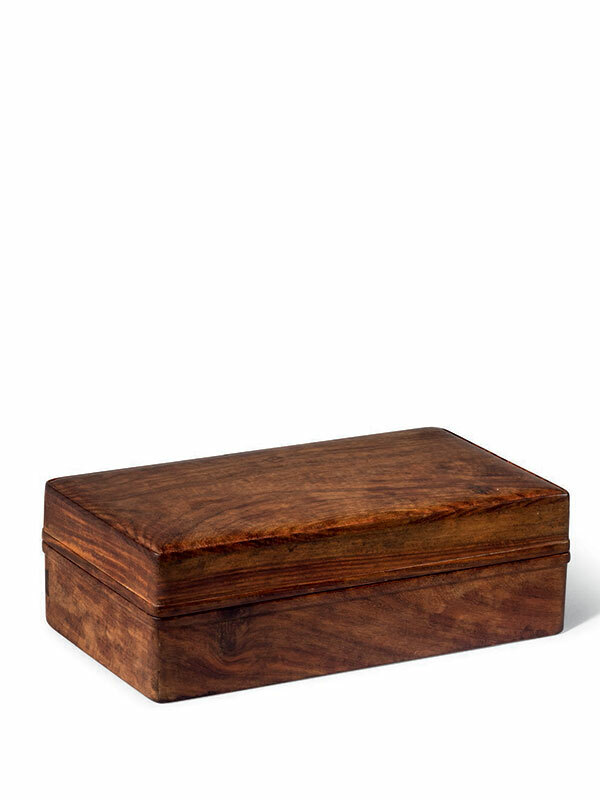 This box is a fine example in its reliance on well- figured wood grain for visual effect. Its beaded edges (qibianxian) not only serve as decoration but also have the practical function of increasing the surface area where the rims meet, thus making the box more durable. It employs no reinforcing hardware and allows for the dovetail joints to be visible on the exterior, showing the careful joinery with highly aesthetic effect. A rectangular huanghuali box, with comparable undecorated sides, beaded lips and dated to the late 16th to early 17th century, is in the Dr. S. Y. Yip collection. It is catalogued as an inkstone box due to traces of ink, attesting to the usage of this box. Another example of a huanghuali stationery box in square form, dated to the 18th century, is in the collection of the Minneapolis Institute of Arts.